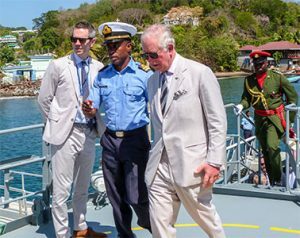 In a whirlwind visit to St Vincent which lasted a few hours, His Royal Highness Prince Charles was taken across the country in car and by boat, planting trees, laying wreaths and greeting persons. 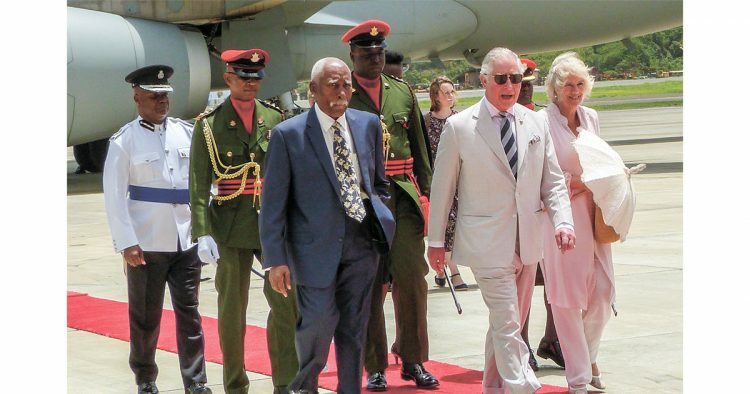 The Royal Air Force glided in to St Vincent and the Grenadines (SVG) carrying Prince Charles and the Duchess of Cornwall, Camilla Parker Bowles, along with a host of personal staff, security and foreign media this Wednesday. Three squadrons from the Royal St Vincent and the Grenadines Police Force were already waiting in the midday sun on the tarmac of the Argyle International Airport (AIA), before the jet had even landed. Outside, there was a line of primary school students waiting with miniature Vincentian and Union Jack flags. Their teachers stood behind them as they asked where was the prince. From there, the Prince’s delegation moved swiftly to the Brighton Mangroves. On the way, the long line of official vehicles, complete with an ambulance, gained the attention of people on the road, and even those in their houses. One man could be observed appearing to tell a lady who came onto the porch with an Ipad that the vehicle with the prince had passed. Once the delegation reached the mangroves the sun was high in the sky. Serenaded by the tones of the steel pan, the Prince was shown school projects that had been entered into the National Science Fair, and other conservation projects. One shy little girl hugged a woman, presumably her mother, after she had discussed her project with him. 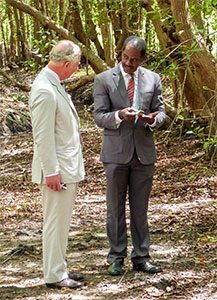 Officer in charge of special projects in the Prime Minister’s Office, Dr Jerrol Thompson, guided the Prince through the paths of the mangroves, and at one point, Thompson could be heard discussing the plant “seed-under-leaf” with him. Soon after, the Prince unveiled a sign about the Prospect Brighton Mangrove Conservation Park. The next stop was the Coastguard base in Calliaqua where Commander Brenton Caine escorted him around the premises, where he greeted coastguard officers and marine cadets. After this, he boarded the Captain Hugh Mulzac for the short trip by sea to Kingstown (https://youtu.be/_nj92IE7XIs). Later that day, when the Prince finally give his speech at the Investiture Ceremony of Sir Cecil Cyrus, he mentioned the importance of this to him. “I am also very proud to acknowledge the remarkable contribution made over the many years by all the marvellous Vincentian sailors who have served, or who have served today, in the Royal Navy. 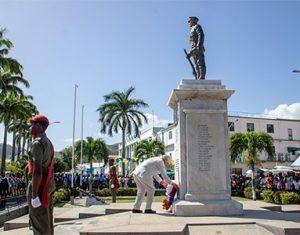 More than from any other country in the Caribbean as it turns out, as well as those personnel who have served in other branches of her Majesty’s Armed Forces, and whom, incidentally, it is always a great joy to meet during my visits to ships, and military units,” he noted. On the Mulzac, the Prince was eventually taken to the helm of the boat, which engined along while being accompanied by security in the form of an additional coastguard vessel which travelled alongside it. The Duchess of Cornwall waited alongside school children at the cruise ship terminal in Kingstown to greet him, before they were taken to the cenotaph. Here, in memory of those Vincentians who died fighting in World War I and II, he laid a wreath while the Duchess looked on, with her parasol above her. Of all the sites which were paid a royal visit, the cenotaph and the market, being in the heart of the capital, had the largest crowd. After greeting cadets, girl guides and brownies, the Duchess and the Prince moved along Bedford Street, between the market and the Bank of SVG. Among the colourful characters there, the Prince spoke with Angus “Sappy” Evans who claimed to be the mascot for SVG, in a tri coloured wig with the national colours, a large National Flag blowing over his head, and a Vincy Heat t-shirt. After speaking with the vendors, the Prince headed to the St George’s Cathedral, where he was escorted by former Minister of Culture, René Baptiste, Bishop of the Windward Islands C Leopold Friday, and the Dean of the Cathedral Otis Nichols. He was serenaded by a choir, and as well as shown the stained glass windows of the church. More school students were lined to greet him outside of the church. At the Botanic Gardens, the Prince was greeted by the national bird, the Amazona Guildingii, a group of which cried hello repeatedly. He was also able to feed one, as it sat on his arm. Following this, he planted a Soufriere tree under the watchful eye of the curator Gordon Shallow. The last stop before departure was the Prime Minister’s Residence. Here the Prince made a speech in which he spoke about the challenges affecting the Commonwealth. “It seems to me our Commonwealth family remains as vital today as it has ever been, bringing us together to address some of the most urgent challenges facing our world,” he stated. He spoke about climate change, youth unemployment and stated that he began the Prince’s Trust in the United Kingdom with a view to helping young people experiencing challenging circumstances and difficulties. “From a base in Barbados, we are expanding the work of Prince’s Trust International across the Caribbean, and I can only hope that in St Vincent and the Grenadines, as elsewhere, my Trust might be able to make some small difference by helping young Vincentians achieve their true potential,” the Prince stated.